Like I said before, Memphis, TN is a hotbed for Division 1 talented players. Deja Foster, Wooddale HS, now at Georgia Tech. Memphis, TN represented on the ESPN Hoopgurlz Post Summer 2009 Rankings. Registration will continue for the Super 80 Fall League this Wednesday, August 27, from 6pm -8pm at White Station High school. Also, the league will be aired on the Television show She Got Game on Saturdays. For any questions call Eric Robinson at (901) 864-0415 or (901) 237-2175. WNBA's Detroit Shock has signed Ashley Shields to a 7 day contract. 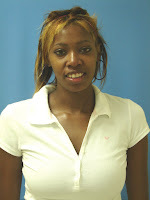 Katelyn Butler-Morris transferred from Hutchinson School to Lausanne Collegiate School. She brings a SWEET jump shot and slashing abilities to the table. 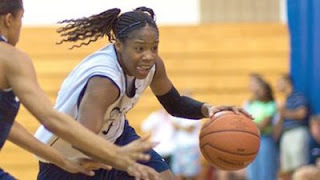 Lausanne Collegiate School's, Lauren Avant, and Bartlett High's, Jasmine James, are listed as a Top Player for the summer of 2008 by ESPN Hoopgurlz. Lauren is ranked #16 and Jasmine in #19. To see the complete Top 20 listing click here. Collierville High School got 2 BIG additions this summer. Sisters, Victoria and Ashley Jones, comes to Memphis from the Nashville area. Victoria, 5'10, is a beast on the court. She is not passive by any means. 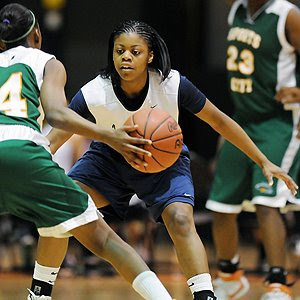 She is great at putting a body on someone and an awesome passer at the post position. ESPN Hoopgurlz establishes Tennessee Flight Silver as the #2 team for the 2008 summer. 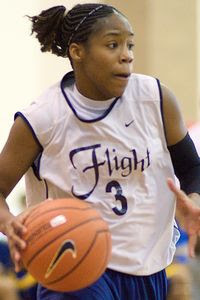 Bartlett High's, Jasmine James, is a member of the Tennessee Flight. To see the complete Best of Summer Top 30 Teams click here. ESPN Hoopgurlz released a list of Dime Droppers (Top Passers) for their Best of Summer Series. East High's, Adrienne Pratcher, was listed number 14. To see complete list of Dime Droppers click here. East High's, Adrienne Pratcher made her mark at the Super 64. Here is the evaluation from ESPN Hoopgurlz Adidas Super 64 Tip Sheet. One of the top players at the adidas Super 64, and one of the top point guards in the country, Adrienne Pratcher showed pretty much the whole package for the Memphis Lady Bobcats. Despite being just 5-6 (generously), Pratcher is solidly built and very strong, and simply goes wherever she wants to on the court. She's a superb passer with great court vision, and can go either way off the bounce -- and can finish at the rim, pulling up, or falling away. On a one-on-one fast break, Pratcher (who goes to Memphis (Tenn.) East High School) came down the right side, spun off the right block into the lane and finished with a left-handed kiss off the glass. Oh, and she has very quick hands. For complete Super 64 Tip Sheet click here. I have to admit. I have a little favoritism towards Ashley. She is my cousin.. However, she is the real deal.. A legit post player. She is 6'2ish but plays so much taller and bigger with her long arms. She does the little things. She rotates on defense as the ball moves. She can play post defense. She has great timing on blocking shots. She blocks out for rebounds. She keeps the ball up high. And she can run the floor. If there was anything that I would say she has to work on is being more agressive.. She is a gentle giant. But not that gentle..
Future Tennessee Vol, Lauren Avant, and Overton High's, Jasmine Robinson, raised some eye brows at the River City Classic tournament. Read entire tip sheet here. Bartlett High's, Jasmine James, decided to play college basketball at the University of Georgia. Keona Brooks (Southwest TN CC), 6'0 forward from West Memphis, TN, signs a National Letter of Intent to play for Marshall University. Bartlett High's, Jasmine James, was announced a member of the Nike Nationals All-Tournament First Team . To see the entire All-Tournament Team listing click here. Blue Star Basketball will be hosting their Rising Blue Star Camp in Memphis this weekend, August 8-9. The event is for girls ages 12 -14. Rising Blue Star Camps are Blue Star's Grassroots Camps to help identify the top young players in the country. These camps are in their 6th year of existence, and bringing the top 7th/8th/9th graders together in various regions to compete. Blue Star evaluator(s) will be on hand to assess players, and all participants will be included in the Rising Blue Star Report that goes to college coaches. A college recruiting lecture will also be given regarding the upcoming process for parents/players to attend. Each participant will receive a Nike Rising Blue Star Tshirt. Bartlett High's, Jasmine James, scored 17 points for the Tennessee Flight against Boo Williams Elite in the Nike Nationals tournament title game. For complete coverage of game click here. For more on Jasmine James performance click here.